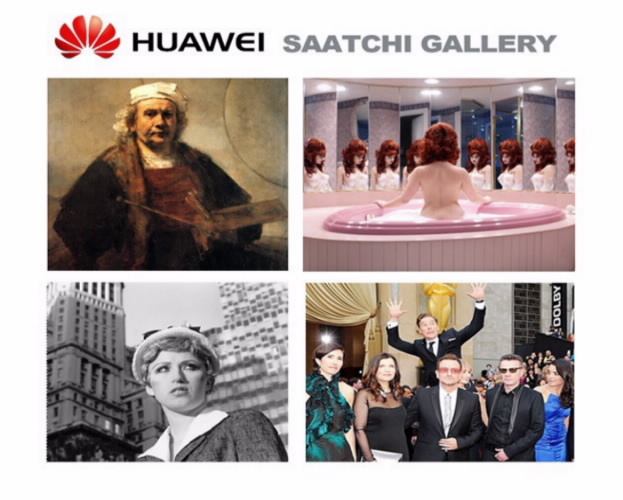 Clockwise from top left: Rembrandt van Rijn Self-Portrait with Two Circles, Juno Calypso The Honeymoon Suite, Actor Benedict Cumberbatch jumps behind U2 at the 86th Academy Awards in Hollywood, California, Cindy Sherman Untitled Film Still #21. The show will also highlight the emerging role of the smartphone as an artistic medium for self-expression through the commissioning ten exciting young British photographers to create new works using HUAWEI’s new HUAWEI P10 dual lens smartphone co-engineered with Leica, as part of their artistic practice. Reprising the spirit and energy of the Young British Artist movement first launched 25 years ago; the works of these young British photographers will go on display in a gallery dedicated to world-class smartphone photography. In this gallery the focus will shift from Selfie to documenting the world around us as a contrasting form of Self-Expression. The judging panel, Tracey Emin, Idris Khan, Juergen Teller, Juno Calypso and Saatchi Gallery CEO Nigel Hurst, will select a shortlist of ten from the 14000 selfies entered by the public. In addition to having their selfie showcased at the Saatchi Gallery the ten shortlisted winners will also receive HUAWEI’s new HUAWEI P10 smartphone, and the overall winner will have an all expenses trip to join a Leica Photography Ambassador on an international photo shoot assignment. The overall winner of the #SaatchiSelfie Competition will be announced at the show’s launch in London on 30th March 2017.